If National Service is truly a matter of National importance and a form of Service to the country, then why is it that only males need to serve – and not females? Earlier this year in March, the Singapore Armed Forces Volunteer Corps (SAFVC) started training for their first batch of enlistees. The SAF saw it as a way to engage more females in military service and hopefully encourage more Singaporeans to step forward. The initiative was well-meaning, but failed to tackle the larger, more systemic problem of gender inequality that lay at the core of Singapore’s system of conscription. In this article, we examine the issues at the core of this discussion on a topic relevant to all Singaporeans. In particular, this issue is especially relevant to Rafflesians because half of us have to go on to serve in the military, while the other half of us have the option to do so. Through writing this article, Raffles Press hopes to ignite an old debate about women serving in the military, and hopefully get Rafflesians to ponder the significance and meaningfulness of doing military service in Singapore. Ultimately, we hope this encourages more females to serve in the military alongside their male peers. What’s stopping women from serving mandatory NS? First, and most commonly argued, is that Singapore’s military is large enough at the moment and does not require additional manpower. This argument evaluates the needs of our existing military and contends that what the SAF needs right now is not more manpower, but rather more technology and equipment that can boost its capabilities, or ‘force multipliers’. Examples of these include fighter jets, armoured tanks, battleships and the like. In other words, this argument suggests that the SAF does not require more soldiers, but rather, more skilled soldiers to enhance its current functions. The second argument lies in the physiological differences between men and women – many reason that males are better suited to a job in the military because they develop muscles more quickly and with larger muscle fibers as well. This means that, compared to his female counterpart of a similar profile, the male NSman is more able to perform physically strenuous tasks and thus is more suited to the military. The final argument takes issue with the removal of more workers from the economy. It asserts that half the population having to start work a whole 2 years later, and even then with regular disruptions for reservist training, is problematic enough – what more with both genders? The first and the third arguments deal primarily with having too many, or rather, too huge a proportion of the working population serving in the military. Both contend that this is unjustified by current needs, and hurts the economic stability of Singapore. Even if it were to be true that serving in the military would hurt the nation’s economic stability, this is immaterial in the larger scheme of things because national defense is so essential in ensuring the survival (even economic survival) of the nation that nothing else would matter without it. For now, assuming that the additional numbers are simply unnecessary to an already large force, the solution lies not in making it compulsory for one gender over the other. Rather, other models of conscription could be attempted – such as Malaysia’s, where conscripts of either gender are randomly chosen by a computer, in a sort of ‘lottery’. This model ensures equality for both genders while taking into account excessive numbers for the military, and could serve as a good example for Singapore’s military. The second argument focuses on the physiological differences between both genders, but fails to grasp a correct characterization of what roles servicemen and women can play in the military. Its fault lies in assuming that all jobs in the military are physically strenuous – if that were true, then maybe the fittest of both genders would be perfectly suited to it. But that isn’t the case. Roles in the military exist on a spectrum – from combat ready troopers to less physically exhausting clerks, drivers, storemen, engineers, medical personnel, the list goes on. Likewise, both males and females exist on a spectrum as well. The fittest female is definitely fitter than the weakest male – and this leaves room for females and males to serve on either end of the spectrum. At present, the military classifies its personnel into different Physical Employment Status (PES) categories. The fittest males are classified into PES A or B categories and are declared combat ready, while the rest take on a plethora of other non-combat roles that are just as important to the functionality of the SAF. A similar system could be employed for the sorting of females into their different deployments, although tweaks could be made to adapt to the physiological differences inherent to both genders. However, these differences should be no barrier to equality in the military. Why then should women serve? While the arguments for this case may not be as varied as those against, they certainly make strong points. One of the strongest argument deals with the concept of military service as a national duty above all others, while the other makes the case for gender equality. National service in Singapore is important – far more so than in many other nations given our unique circumstances. We are a small island state surrounded by many larger neighbors who have the advantage of natural resources, which we lack. World War 2 showed us that we couldn’t count on anyone else to defend us – and we had only ourselves to rely on. Given this situation, you can roughly tell why National Service in Singapore is a national duty, and not just another area of service. It’s important because relying on a volunteer army might not be viable given our small numbers – we therefore need every single person we can get to be well trained in defending this island. Following this logic, a national duty implies that every citizen who takes advantage of the nation’s resources and opportunities is obliged to serve and fulfill this national duty – even females. Applying this to the context of national service in Singapore, one can now see why it only makes sense for women to commit themselves to something of national import. On top of the principal obligation that all citizens have, having females serve in the military furthers their rights as well. It shatters the narrative that females are weaker than males simply because they cannot serve in the military. While Singapore is largely equal in its treatment of both genders, having both genders serve in the military ensures that no one gender is at an advantage because of their obligations to the nation, and helps to preemptively prevent any discrimination – either against males or females. Hopefully, this ensures that both genders can have access to the same benefits while fulfilling the same obligations as well. All in all, it seems clear that in the name of gender equality and fulfilling an important national duty, National Military Service in Singapore should be a job not just for men – but for women as well. Earlier on in the year, Rafflesians responded to a survey posted by Raffles Press in which we asked if Singaporean females should be made to serve national service. Here’s what they had to say. A total of 84 respondents filled in a survey where we asked them for the views on National Service, its importance, and if women should serve. 48 females made up 57% of the sample size, while 36 males composed the other 43% of respondents. 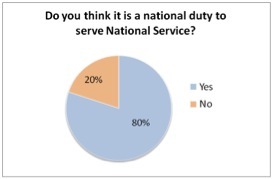 67 of them (80%) thought that National Service was a national duty, while 17 (20%) felt otherwise. Of the 17, some of them felt that while NS was a bad idea, double standards should not exist. In other words, if males were required to serve, females should do so too. However, more respondents felt that National Service was important for Singapore, with 72 (86%) of them indicating so. The other 12 (14%) of them had other reasons for opposing conscription, namely being in favour of a professional army, economic reasons, and the belief that Singapore is highly unlikely to require military might in the near future. When asked if women should be made to serve National Service, the responses from males and females differed quite vastly. 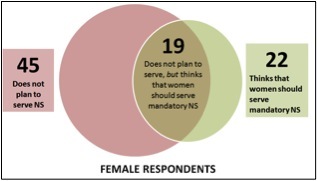 25 male respondents felt that women should serve mandatory National Service (69.4%) while 11 felt otherwise (30.6%). In stark contrast, a majority of 26 female respondents felt that women should not serve (54.2%), as compared to only 22 who felt otherwise (45.8%). Overall, 47 (56%) of respondents felt that women should be made to serve mandatory National Service, while a minority (though not by much!) of 37 (44%) thought otherwise. Similar views were echoed by another respondent, who pointed out that ‘equal rights for both genders also means equal duties’ and that ‘it shatters the narrative that women are weaker than men’. On the flip side, those who were against mandatory NS for women cited reasons of economic stability, differences in physique between both genders, and the existence of other area for women to serve in. ‘While NS is important, so is the economy. Having around half the population spending 2 years in NS when they could have been working or studying (basically contributing to (the) economy) is already bad enough. There isn’t a need for women (who are physically weaker and less suitable to take up strenuous physical activities like NS). Instead, they should contribute to Singapore in a way that is more beneficial for all,’ quipped one female respondent. When it came to the female respondents, 45 of them had no plans to serve National Service. 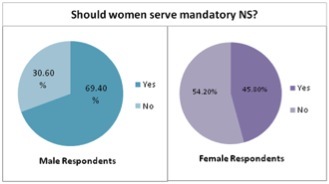 Of the 22 female respondents that felt women should mandatory NS, only 3 of them were willing to serve NS, regardless of whether it was mandatory. The other 19 were part of the 45 who had no plans to serve in the military after graduating. It seems that while the a majority of Rafflesians feel that women should be made to serve mandatory National Service, there still exists a huge portion of females who need to be convinced. At the same time, Singapore’s government needs to find the right balance between equality and economic prosperity, a reason cited by many respondents against NS for women. I am an Old Boy currently serving full-time National Service in a combat unit. I would just like to give my two cents’ worth on this article, informed by my military experiences as well as a very crude understanding of international-relations theory. The writers raise three counter-arguments that they successively attempt to dismantle. But I would like to argue for the merits of those arguments. First, that the SAF does not need more manpower. The truth is that it does. In the offensive-realist tradition (which the Singapore Government clearly subscribes to), a state’s survival can only be assured by a strong military, one contributing factor to which is the availability of military manpower. 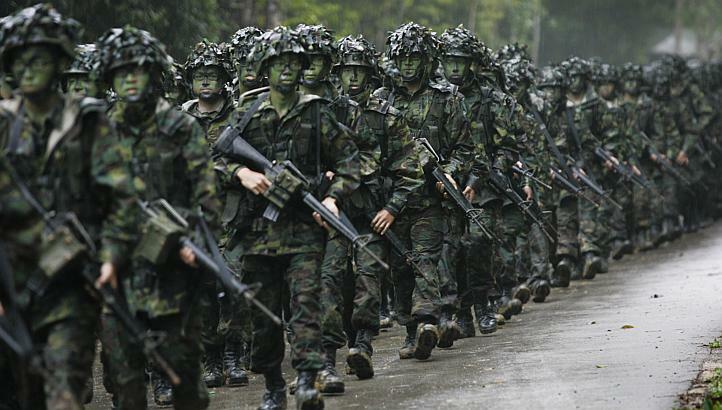 The SAF would love to raise a thousand infantry divisions if it could. Unfortunately, we don’t quite have enough people in Singapore to do it. That is why we need force multipliers to augment our limited human resources. Causation does not flow the other way; that because we have force multipliers we can make do with less manpower. Second, that physiological differences exist between men and women. They do, and in a way that influences our security needs. I do not know the specifics, and even if I did I would not be in a position to discuss them. But states are rational actors, not least our very calculating Government. You can be assured that if the military really does require the services of women, tomorrow it’ll be in The Straits Times and next month they would start conscripting girls. The legislative framework for doing so exists after all (the Enlistment Act is gender-neutral). Third, that it would be overly disruptive to the economy. I cannot make the calculations to prove this, but I am certain our Government has, and has concluded that the economy would be better off with the status quo. After all, economic strength is the other contributing factor to a strong military, for maintaining the armed forces is a very expensive endeavour. The authors then raise their arguments for the equality of service, chiefly that National Service is a duty and an equaliser. NS must therefore serve the purpose of national security first and foremost. If conscripting women will further this end, then the Government should. However, it seems that all signs point to a no, because if the Government really thinks it should, then tomorrow The Straits Times would feature Dr Ng Eng Hen on the front page, explaining why women will be serving NS starting 1 June 2015. The other two goals are legitimate and important as well. But they come into the picture if and only if the first goal (of national security) has been established. In fact, you could argue that under the status quo, the second and third goals are already being fulfilled by women even without being in uniform. One-third of a woman’s tax dollar goes towards national security, including the GST that you just paid in the RI Popular bookstore. And of course we must consider the women themselves too. They’re not just pawns in an international-relations game, but someone’s daughter, sister and girlfriend too. They will be especially susceptible to the scourges of war, ie sexual assault; the battlefield is very likely to be dominated by men, as our adversary may not be quite as gender-progressive as we are. It does not matter if you place women into combat, support or service roles; in desperate times the entire army moves into the field and suffers together. What will be the impact on morale, both on serving women and their male comrades? I have one argument in support of full gender equality in military service though. The human race has come to realise that sexual and gender identity is not clear-cut in every case, and that such is in fact the natural state of affairs. Not everyone can be classified as male or female, gay or straight. It would be much more expedient, administratively and ideologically, to dispense with such classification altogether and treat all Singaporeans equally. For many conservative Singaporeans that may be too far a step though. After all, homosexuality is patently a Western disease imported through decadent propaganda, and has absolutely nothing to do with genes. Nice try with the comment and thumbs up, PAP IB. We are not daft. I don ‘t have much to add to this article. However the over-glorification of NS and war; its perception as a necessary national duty in Singapore is something that leaves much to be desired. This is a book describing the horror and brutality of war. Most often those asking young men (and women) to die for their country are those who do not need to fight.